At Rebasco Decorators we offer the finest brands of laminate flooring at affordable prices. Families with active lifestyles that are looking for an alternative to wood should definitely look at our selection of laminate floors. They offer an easy-to-clean finish, high resistance to scratching and are less expensive than most real wood floors. With our wide assortment of laminate flooring we can match any room decor, from formal, traditional, country, or contemporary. Let our professional sales staff help you find the floors that will bring your rooms alive! Our large selection also includes laminate floors that do not require any glue. These floors are ideal for do-it-yourselfers! If you prefer, we also offer professional installation, backed by a full one year guarantee. 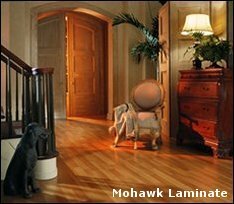 Why Choose A Laminate Floor?